It’s a playful slogan that Giants television announcers Duane Kuiper and Mike Krukow throw around to describe the way the Giants have played all season. But the slogan meant as a joke has turned into a reality in the form of a five game losing skid for the Giants, which consists of a 13-1 loss to Arizona, and only one run produced against their Bay Area rivals, the Oakland Athletics, who swept the series this weekend at Oakland Coliseum. Currently, the Giants have a scoreless inning streak standing at 20. It’s pretty sad to see a World Series-caliber pitching staff not get any run support from its offense. 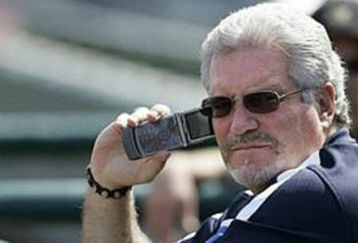 It makes me wonder if Brian Sabean really cares about winning what should be a pretty division title. I have one simple message for Sabean: GET A BAT! Just get a bat! I don’t care who you trade to get it,I don’t care if you have to get Jermaine Dye off of his couch, I don’t care if it’s Buster Posey, just get a bat, what is wrong with you? This has been going on for three years now. Yes,the Giants won 88 games last year, but that’s all great pitching and one-run games will get you. It’s pretty frustrating to see pitchers like Matt Cain and Jonathan Sanchez turn in quality starts yet getting losses on their records because there wasn’t somebody to get a big hit or bunt the runner in scoring position over to third base. It’s pretty messed up when Giants fans all throughout the weekend are playing virtual GM on message boards and Facebook. It seems like they’re putting more thought into the future of the team they root for than you are when you actually run the team. This is a team that should be vying for a World Series berth this year, and right now,they look like their headed for a disasterous and disappointing year. It’s bad enough now that A’s fans, who aren’t nearly as loyal as Giants fans, will rub it in our faces that they’re better than us when we know that this Giants team is better than this. It’s kind of like seeing your enemy who isn’t as good looking as you taking the head cheerleader to prom and they end up getting elected king and queen. It’s a very bitter and uncomfortable feeling.And just to let you know, the massive crowd that the A’s had this weekend will revert back to it’s usual under 10,000 a night beginning with their next home stand against the Minnesota Twins on Jun. 4, but I already wrote that column, and none of you read it. This year’s official slogan for the Giants is It’s Magic Inside. For the time being, Giants fans, it looks as though that magic is rapidly fading away. Thanks a lot,Brian!